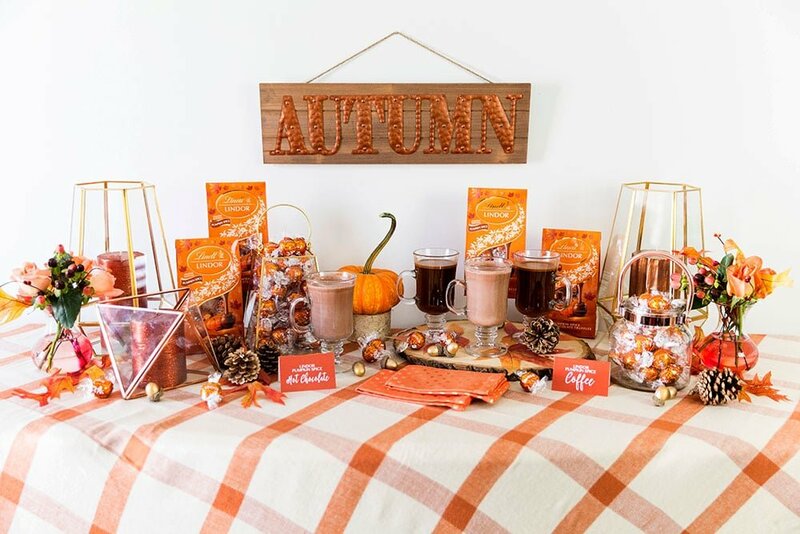 Grab all your favorite fall decor items! This fully gives you an excuse to splurge on a fun new fall blanket because not only is it perfect for snuggling up with, but it also serves as the best covering for your bar setup. You can also style this on a bar cart, but I used a sidebar table in my dining room. Headed to a tailgate? Set it up there! Fall bake sale? You get the idea! It’s easy to recreate this simple bar anywhere. Next up, copper and gold lanterns with fall candles gave the perfect aromas for the autumn season. Fall leaves, gilded acorns and pinecones, and wooden serving boards give that seasonal touch to my bar. Naturally, the LINDOR Pumpkin Spice Truffles are the star of the show so I used extra lanterns to hold all the truffles. The color works perfectly to give the bar setup a punch of pumpkin orange. Plus, it’s easy to grab one and drop it down in your drink. Drop it in your drink, that’s right! Ready for this? Drop the truffles into your chocolate or milk and stir until melted. Enjoy! Drop the truffles into your coffee and stir until melted. Enjoy! Let me tell you, this is the only way I’m drinking coffee this season. This basically changed my life. The result is the creamiest most delicious coffee and hot chocolate you have ever tasted. 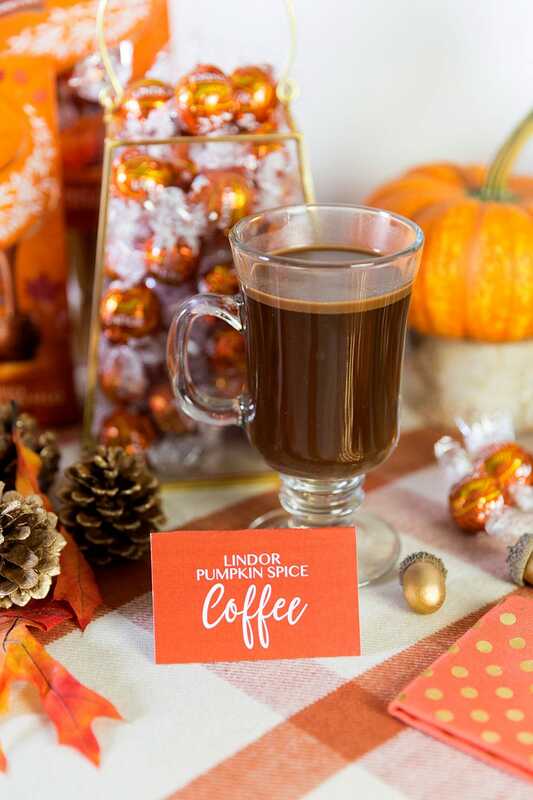 I’m going to keep a mixed assortment of LINDOR truffles next to my coffee machine. Sea Salt…Caramel…oh the possibilities, y’all! Obviously this season it’s going to be the Pumpkin Spice flavor. 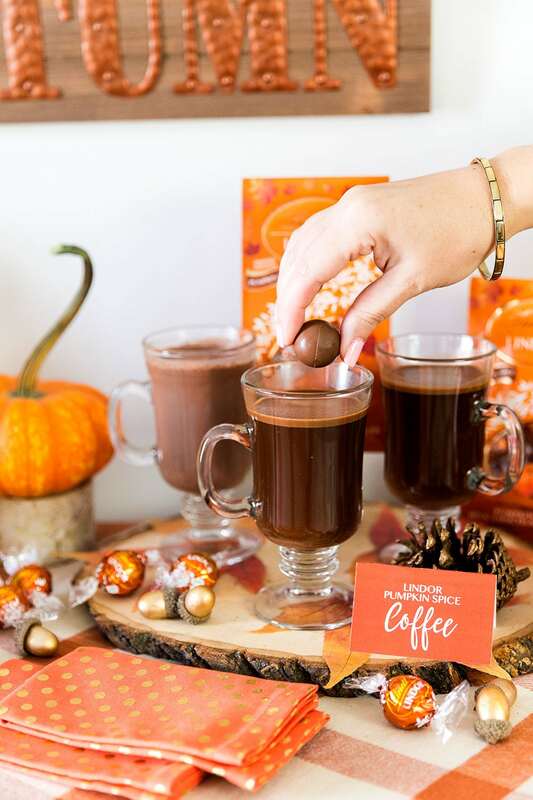 The only bad part about this hot chocolate and coffee bar is trying to avoid eating the truffles straight from the wrapper before they make it into your mug. It’s a struggle… a delicious one! 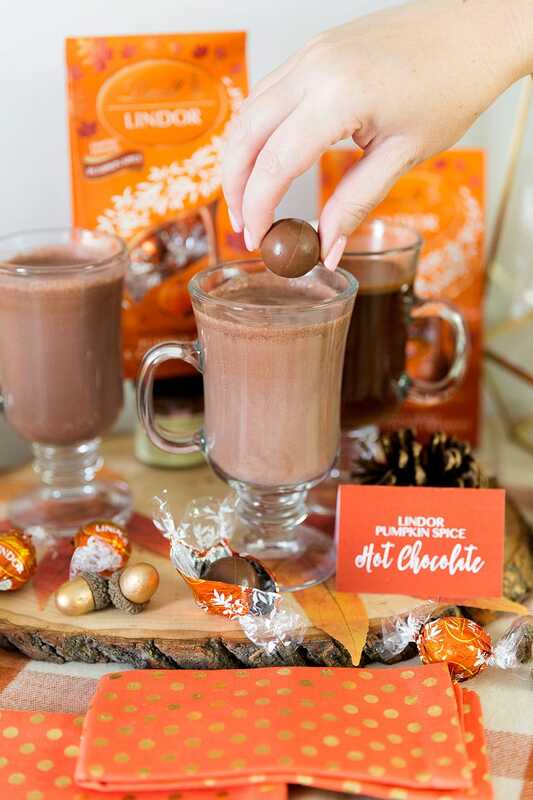 Thanks for supporting the sponsors like Lindt Chocolate that allow us to share our ideas with you! This is such a fun idea for a party! Perfect for fall!